Michael Joyce is not only the author of what many consider the foundational work of hypertext fiction, afternoon, a love story (1987), but also probably the most important theoretician of hypertext as a literary medium (especially in the essays collected in Of Two Minds: Hypertext, Pedagogy, and Poetics, published in 1995). So it is of course tempting to approach his print novels — and most of his fiction in the last 20 years has been conventionally published in print — as somehow continuous with, or at least strongly influenced by, the hypertext works. But while it is certainly possible to seek parallels between the influential hypertext fiction and a novel such as Remedia, his most recent, perhaps it is more useful to see all of the work, hypertext and print-only, as part of a continuum, united not necessarily by the multiplicity and contingency of hypertext per se, but by the attention to craft in the most precise sense: the adroit shaping and ordering of “story” so that the reader’s interest is not solely directed at the particulars of the narrative but also toward the means of its unfolding. It might also seem that Remedia belies the notion of “shaping,” given that its subtitle identifies it as “a picaresque.” Of the various permutations of narrative, the picaresque would seem to be the loosest, the most deliberately unshaped. It could be said that a picaresque narrative even refuses the shape imposed by a conventional plot (of the sort outlined in Freytag’s Triangle), instead focusing on mere succession, one point in a narrative progression after another. But of course the impression of one thing following another in a picaresque narrative (at least a good one) is a constructed illusion, as much shaped by the writer’s sense of the effect to be produced as any “well-made” story. 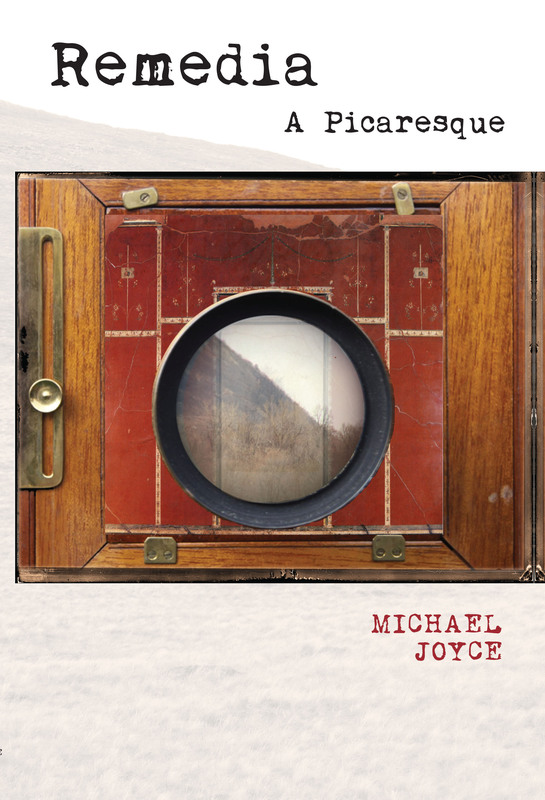 The requirements of a picaresque story is even more subject to a self-conscious act of shaping when the picaresque is strategically used as a kind of deliberately anachronistic formal device, as surely Michael Joyce is doing in Remedia. 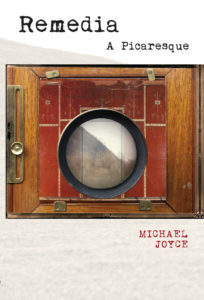 Joyce doesn’t just set his narrator-protagonist on a journey he chronicles as a serial account of his “adventures,” but asks us to consider how the notion of “picaresque” itself affects our perception of the narrator’s state of mind as he is reciting adventures that are indeed unpredictable and uncommon. . . .What I remember is not the door itself but the man who emerged, smiling as he touched a long index finger to his lips as if to signal that our encounter was a secret between us, his face inexpressibly kind, long as a horse’s, his ice blue eyes gleaming. These visions, featuring a door or portal or some other kind of opening (including “random appearances of vertiginous geometric space”) would seem to mark the protagonist as an unreliable narrator, at the very least one susceptible to a slippage in his hold on reality. It’s not that we might doubt the veracity of the account he gives us, but the incidents and experiences he relates, as well as the other characters he encounters, are surely out of the ordinary, making it possible to wonder whether Remedia scrupulously recounts the odd, frequently extreme, but ultimately “real” events the narrator witnesses, or whether these events are partly the product of his mind-altered perception. The story essentially takes us through the narrator’s relationships with two women, Magika, with whom the narrator is involved as the novel begins, and Medb, an Irish woman he meets quite randomly on a bus when he has ventured to Ireland after his relationship with Magika goes on hiatus (she is touring Europe with an experimental theater company). The narrator and Medb relocate to the United States, and eventually make their way to Utah, where they meet up with a Mormon woman, Sariah, and her Native American consort, Tokoa. The narrator’s initial encounter with Tokoa, when the car he and Medb are driving breaks down, at first seems like one of the narrator’s portal visions: “a figure brown as a twist of tobacco stood in loincloth leggings, his long hair held back by a headband, neck garlanded with three necklaces, leather bands around the wrist of his beckoning upright arm as he stood before the oblong entrance of what looked to be a shaded cave.” When his attention is drawn to Tokoa himself approaching from behind and offering assistance (wearing “a broad-brimmed camo Aussie hat that someone had spray-painted neon orange”), the narrator is apparently brought back to reality — while the brown figure “lowered his arm and was descending into the cave” — but thus we have only more reason to suspect that a radically subjective perspective may be distorting the account he gives of his sojourn in the desert that (with a side trip to Iowa) will occupy much of the subsequent narrative related in Remedia. While in Utah, the narrator is visited by Magika, and soon she, Medb, and Sariah have banded together to create a feminist monastery of sorts (although apparently most directly devoted to seeking out “silence”), but the exact nature of this desert compound continues to be rather murky throughout the novel, as the women allow no men to enter, which, to say the least, pleases neither the narrator nor Tokoa. Equally mysterious are the circumstances through which the narrator finds himself in Iowa. Here the narrator refers directly to a “door” he entered — although his fugue might also be the consequence of “a sacred herb thought to be a hallucinogen” he has ingested — and subsequently “emerged from that door six days later on a Beachy Amish farm just outside of Kalona, Iowa, and with little sense how I had gotten there or what I had done in the interim.” The patriarch of the Amish family with whom he finds himself, Jacob, then accompanies the narrator and Tokoa on their trip back west, ostensibly to visit the gravesite of his great-grandmother in Colorado but also, it would seem, in flight from his family and his Amish identity. When the three men reach the “Skull Valley” monastery, the women decide to admit Jacob among their number, just before the compound is itself laid siege by the U.S. military, during the course of which operation many of the members are killed (including Jacob). Both Magika and Medb survive. The narrative thus ultimately culminates in a dramatic, large-scale event, toward which a conventional picaresque novel might be expected to “build.” But Joyce mutes even this means of providing “drama” in a picaresque story by in fact deviating from a strictly successive rendering of events. The narrator skips ahead and moves back in his narration of his experience, and his blackouts and general habits of thought provide substantial narrative lacunae that never really fully get filled. We can’t really be sure exactly what happened between the narrator’s sip of Moon Lily tea and his arrival in Kalone, Iowa; the creation of the Skull Valley monastery, as well as its subsequent activities, are never described in any detail, leaving the creator’s motives and intentions hazy at best; the siege is not related as a continuous episode but instead is alluded to by the narrator at various points (including as the subject of a play that Magika writes in its aftermath). Although the narrative does proceed more or less chronologically, starting in 1987 and ending in 1998 (with entries in the final two chapters that skip ahead to 2001, presumably the date of the entire retrospective narrative’s composition), its status as “picaresque” finally seems more the product of the narrator’s wandering recall than it does the intrepid observations of a nomadic hero. Indeed, for a picaro, the protagonist of Remedia seems remarkably passive. Even though he is closely involved in all of the situations depicted in the novel, things mostly happen to him, not through deliberate agency, and most of the other characters emerge from the novel as both more dynamic and more self-possessed. For all the doorways and entrances the narrator believes are beckoning him forward, he doesn’t seem a very adventurous man, a strange enough state of affairs for a picaresque hero. The novel’s conclusion only reinforces the impression of impassivity: Sariah visits the narrator several years after the siege and urges him to seek out Medb, with whom he has lost contact. “I’ll think about it,” he says. “Thinking’s not doing,” Sariah replies. It might be going too far to say that Remedia is more a novel about thinking than doing. But finally Joyce, in deemphasizing the ostensible hero’s deeds, uses the character’s processing of his often random experiences to create a picaresque narrative that reflects the protagonist’s peripatetic life, but at the same time proceeds forward by following along the narrator’s channel of thought — almost as if the portals he so frequently glimpses are the hyperlinks of consciousness.